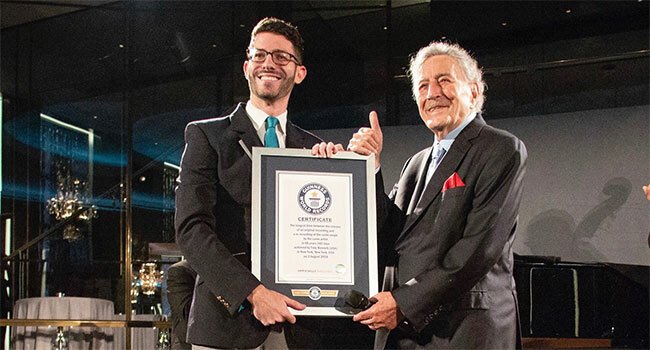 Tony Bennett has earned his third Guinness World Record (GWR) title with the release of his duets album from Diana Krall, Love Is Here To Stay. The 92 year old singer received the latest award for the re-recording of the jazz Gershwin standard “Fascinating Rhythm,” as Bennett originally recorded the song in 1949 under his stage name of Joe Bari at the time. Bennett received the award during an album launch party at the Rainbow Room in New York last week after a performance of the song. Love Is Here To Stay marks the first time that Diana Krall and Tony Bennett have recorded a full album together. The two multi-Grammy winning and platinum-selling artists are in New York City promoting the new album and will be appearing on NBC Nightly News, Good Morning America, The Tonight Show with Jimmy Fallon, Live with Kelly and Ryan among other media outlets. Love Is Here To Stay was recorded with the Grammy award winning Bill Charlap Trio and the stunning result is a subtle, sophisticated and beautifully rendered love letter to The Gershwins’ music and their status as one of the premiere songwriters of the American popular standard. It is a masterclass in vocal delivery and phrasing and the command that Bennett and Krall display of the material in both their duets and solo tracks makes it appear effortless, belying the honed skill of the vocalists. The duet tracks include “Love Is Here to Stay”, “S’Wonderful,” “They Can’t Take That Away from Me” and “Fascinating Rhythm,” among them. Love Is Here To Stay was produced by Grammy Award winner Dae Bennett and Bill Charlap with Danny Bennett as Executive Producer. The Bill Charlap Trio features Bill Charlap on piano, Peter Washington on bass and Kenny Washington on drums.